Taking a unique look at one of the most acclaimed and best-loved poets, this title provides fascinating insight into the life and times of Scotland's national poet. We learn about his romantic, tragic life, his journey from underdog to celebrity and about his family and childhood. With much reference to his most famous works, Fiona MacDonald explores his profound, passionate poetry as well as his use of the Scots language and his inspirations and influences. 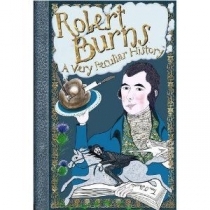 Featuring quirky stoeis and entertaining trivia throughout, find out what makes Burns so captivating, to Scottish people first and foremost, but also to countless millions around the globe.